The Mazda3 4-Door stacks up well against its competitors, with athletic handling and an upscale interior. 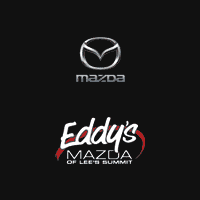 View our inventory of Mazda3 4-Door models with SKYACTIV® TECHNOLOGY at Eddy’s Mazda of Lee’s Summit, then contact us to schedule a test drive. * 61 people have viewed this vehicle! Priced below KBB Fair Purchase Price! Factory MSRP: $21,040 $2,063 off MSRP! 28/37 City/Highway MPGJet Black 2018 Mazda Mazda3 4D Sedan Sport 2.0L 4-Cylinder Automatic FWD 28/37 City/Highway MPGOur experienced sales staff is eager to share its knowledge and enthusiasm with you. We encourage you to browse our online inventory, schedule a test drive and investigate financing options. You can also request more information about a vehicle using our online form or by calling (816) 434-6040. Servicing the greater Kansas City area (MO & KS) including Overland Park, Olathe, Lawrence, Lenexa, Manhattan, Hutchinson, Leavenworth, Topeka & Mission. * 106 people have viewed this vehicle! Priced below KBB Fair Purchase Price! Factory MSRP: $22,235 $2,640 off MSRP! 27/36 City/Highway MPGSnowflake White Pearl 2018 Mazda Mazda3 4D Sedan Touring 2.5L 4-Cylinder Automatic FWD 27/36 City/Highway MPGOur experienced sales staff is eager to share its knowledge and enthusiasm with you. We encourage you to browse our online inventory, schedule a test drive and investigate financing options. You can also request more information about a vehicle using our online form or by calling (816) 434-6040. Servicing the greater Kansas City area (MO & KS) including Overland Park, Olathe, Lawrence, Lenexa, Manhattan, Hutchinson, Leavenworth, Topeka & Mission. * 38 people have viewed this vehicle! Recent Arrival! Priced below KBB Fair Purchase Price! Factory MSRP: $22,335 $2,000 off MSRP! 27/36 City/Highway MPGMachine Gray 2018 Mazda Mazda3 4D Sedan Touring SKYACTIV® 2.5L 4-Cylinder DOHC 16V 6-Speed Automatic FWD 27/36 City/Highway MPGOur experienced sales staff is eager to share its knowledge and enthusiasm with you. We encourage you to browse our online inventory, schedule a test drive and investigate financing options. You can also request more information about a vehicle using our online form or by calling (816) 434-6040. Servicing the greater Kansas City area (MO & KS) including Overland Park, Olathe, Lawrence, Lenexa, Manhattan, Hutchinson, Leavenworth, Topeka & Mission. Factory MSRP: $23,535 $2,000 off MSRP! 27/36 City/Highway MPGSonic Silver Metallic 2018 Mazda Mazda3 4D Sedan Touring 2.5L 4-Cylinder Automatic FWD 27/36 City/Highway MPGOur experienced sales staff is eager to share its knowledge and enthusiasm with you. We encourage you to browse our online inventory, schedule a test drive and investigate financing options. You can also request more information about a vehicle using our online form or by calling (816) 434-6040. Servicing the greater Kansas City area (MO & KS) including Overland Park, Olathe, Lawrence, Lenexa, Manhattan, Hutchinson, Leavenworth, Topeka & Mission. Factory MSRP: $23,835 $2,000 off MSRP! 27/36 City/Highway MPGRed Metallic 2018 Mazda Mazda3 4D Sedan Touring 2.5L 4-Cylinder Automatic FWD 27/36 City/Highway MPGOur experienced sales staff is eager to share its knowledge and enthusiasm with you. We encourage you to browse our online inventory, schedule a test drive and investigate financing options. You can also request more information about a vehicle using our online form or by calling (816) 434-6040. Servicing the greater Kansas City area (MO & KS) including Overland Park, Olathe, Lawrence, Lenexa, Manhattan, Hutchinson, Leavenworth, Topeka & Mission. Recent Arrival! Factory MSRP: $23,835 $2,000 off MSRP! 27/36 City/Highway MPGMachine Gray 2018 Mazda Mazda3 4D Sedan Touring SKYACTIV® 2.5L 4-Cylinder DOHC 16V 6-Speed Automatic FWD 27/36 City/Highway MPGOur experienced sales staff is eager to share its knowledge and enthusiasm with you. We encourage you to browse our online inventory, schedule a test drive and investigate financing options. You can also request more information about a vehicle using our online form or by calling (816) 434-6040. Servicing the greater Kansas City area (MO & KS) including Overland Park, Olathe, Lawrence, Lenexa, Manhattan, Hutchinson, Leavenworth, Topeka & Mission. * 33 people have viewed this vehicle! Why Get a Mazda3 4-Door From Us? Visit our dealership near Kansas City and Independence to find your new Mazda3 today!